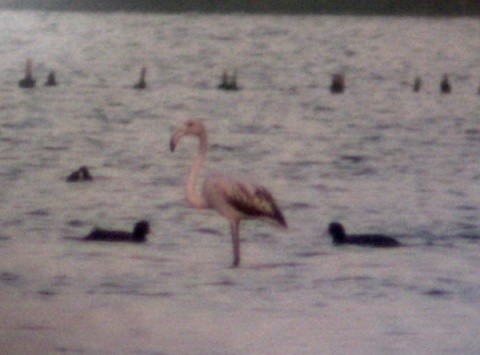 The lone pink flamingo individual spotted in Atanasovsko Lake near Bulgaria's Burgas (best resolution available). Photo by the Bulgarian Society for the Protection of Birds. A pink flamingo - a rare visitor to Bulgaria - has been spotted over the weekend near Bulgarian Black Sea major city of Burgas. The lone bird has been spotted in the Atanasovsko Lake north of Burgas, announced the Bulgarian Society for the Protection of Birds Tuesday. Apart from the Black Sea, the city of Burgas sports three major sweetwater lakes near joined with the sea - Mandra, Vaia and Atanasovsko - which makes it an attractive spot for wild birds, especially during the period of migration. The Society for the Protection of Birds commented that the sighting is unusual, since the pink flamingo usually travels in huge flocks. Pink flamingos were seen in Bulgaria for the last time five years ago, when 3 birds from the species were sighted south of Burgas. In Europe, the usual sites inhabited by the pink flamingo are in France and Spain.